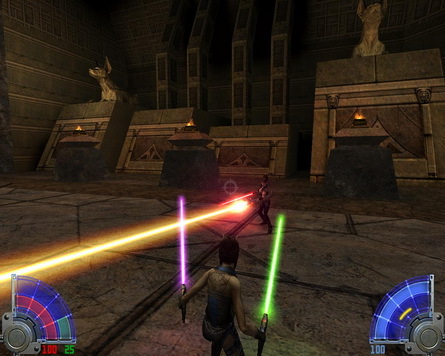 Jedi Academy captures the excitement of lightsaber combat perfectly and not to far into the game allows the player to select between single, dual or a staff lightsaber. The problem with Jedi Outcast was the amount of tedious levels you had to play before you got your lightsaber, in this game you have it from the start and can customize it to your liking. I tend to favor dual lightsabers in green and purple, I have no idea why. After completing the single player I was actually surprised when I logged into multiplayer to find servers still running and being played online.